We here at SolidBox value productivity above all in our applications and of course, our hardware. Each week, we’ll be giving you a tip to help you enhance your productivity with SolidWorks specifically. Sorry, we can’t help you with the hours you spend on Youtube each week watching cat videos. Nonetheless, hopefully you can learn something to make your SolidWorks experience easier. This week we’ll discuss how to reduce file sizes with multiple exploded views. We’ve all dealt with massive file sizes that make our CPU groan. 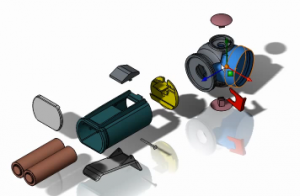 Now SolidWorks helps us to reduce file sizes of parts, assemblies, and subassemblies by allowing multiple exploded views to be associated with one file. This video discusses exactly how to take advantage of this feature and how it can save you space.